A £20 million plan to transform Perth City Hall has been approved, triggering a jobs boom. 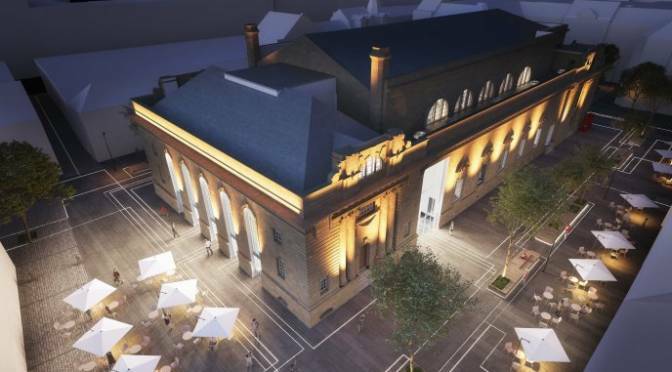 Council bosses have secured planning consent to convert the historic venue into the Fair City’s equivalent of the V&A, expected to attract more than 160,00 visitors each year. And a study has revealed the ambitious project could create work for nearly 200 people, while pumping around £1 million into the economy. Council boss Murray Lyle said it was “now full-steam ahead” for the project. The work will involve a major overhaul of the former hall, two large gateways – decorated with curved, bronze-coloured metal – built on the north and south sides of the building. The original entrance doors, on the west side, will be replaced with huge windows, offering views of the exhibition area. A 70-cover cafe will be created in the lesser hall. Sections of the roof are expected to be repaired or replaced. Perth and Kinross Council is still hoping to secure the Stone of Destiny as a centrepiece. The authority faces a battle with Edinburgh Castle which wants to retain the relic as part of its historic display. An archaeological survey will be carried out at the hall before any work can begin. It is believed the site, next to historic St John’s Kirk, could hold remains of an ancient burial ground. The city centre venue, which was built more than a century ago, has stood empty since 2005. The council attempted to have it demolished in 2011, but the plan was blocked by Historic Scotland. Helen Smout, chief executive of Culture Perth and Kinross said she was delighted the city hall project had reached this key milestone. In her report backing Dutch firm Mecanoo’s design, council planning officer Diane Barbary said: “The economic proposal is considered to be significant, with the project likely to expand the tourism economy as part of Perth’s wider economic strategy. “In terms of employment, there are direct (employment within the museum), visitor (employment in the wider economy) and construction-related (during the refurbishment phase) impacts as a result of the proposals.